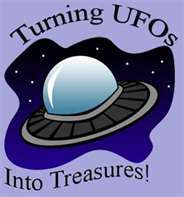 The UFO Challenge will begin in July 2018 and finish at our June 2019 guild meeting. 1. Turn in a list of 10 of your UFOs (Unfinished quilting projects) numbered 1-10, along with a $2 fee. Keep a copy of the list for yourself. You can join or quit at any time. If you don't happen to have 10 quilt-related UFO's, just repeat what you have for a total of 10. 2. We will draw a number after the break at the designated meeting. You will work on that project and turn it in FINISHED at the “due” meeting. Finished means quilted and bound. 3. Every other month, if you wish to continue participating, you can keep the same list or turn in a new one, pay $2 and show your finished project when it is due. If you’ve repeated an item on your list and we draw that number, you’ll need a new list. May due in June - only one month. We will have a drawing for prizes at the end of the year from those who have completed one or more of their UFOs. Plus, you’ll have completed up to five of your unfinished projects!!! This will be a fun way to get those UFOs finished. Please join in!